India has made leaps and bounds in its renewable energy developments, and is shaping up to be a leader in solar energy. Some are calling for a 100% renewable energy mix by 2050 – and Manish Ram argues that with the right policy, India could make that happen. The Paris Agreement reached at the 21st Conference of Parties (COP) in December 2015 was a major milestone that capped more than two decades of global negotiations aimed at averting dangerous climate change. The outcome was reflective of wider acceptance that a low-carbon transformation of the world’s energy systems is indeed possible, even inevitable, in the context of rapidly falling renewables costs and an unprecedented degree of action by nations, civil society, businesses, industry, cities, and other stakeholders. Prices for renewables-based electricity have been dropping globally and more so in India. In this context, India has endorsed renewables as the future source to fuel the rapid growth engine. According to the Ministry of New and Renewable Energy (MNRE), the country’s total renewable energy capacity including solar, wind, biomass, and small hydro grew by around 11,200 megawatts (MW) in FY 2016-17, which is at par with conventional thermal power capacity addition that registered a decline of 50 percent in comparison to the previous year. Across the country about 5,526 MW of new solar capacity (an increase of 83 percent over FY 2015-16) and roughly 5,400 MW of new wind capacity (up by 63 percent) was added in the year. Despite the impressive performance of the renewables industry, the Indian energy sector continues to be plagued with multifaceted challenges. These include but are not limited to increasing energy demands with the rapidly developing economy and rising population, increased fossil fuel imports, deficits in meeting the electricity demand, and high shares of greenhouse gases from the energy sector in national emissions stack and still a lack of access to electricity to almost one-fourth of its population (26 percent of rural households). The government has recently revised the target of renewable energy capacities in India to 175 gigawatts (GW) by 2022. However, a long-term strategy to integrate large-scale expansion of renewables in order to address the above-mentioned multi-dimensional challenges is still missing. NITI Aayog, which was constituted by the Indian government to enhance the policy-making process, undertook an energy scenario building exercise—the ‘India Energy Security Scenarios (IESS), 2047’. This web-based planning tool presents two scenarios—the Maximum Energy Security Pathway (MESP) and the Maximum Clean and Renewable Energy Pathway (MCREP) in order to fulfil the energy demands in 2047. 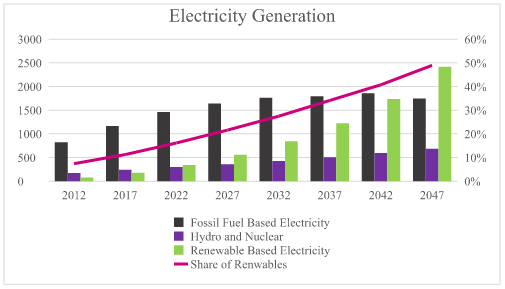 Considering the MCREP, the share of renewables in the enhanced proportion of electricity in the energy mix is estimated to be around 49 percent in 2047 in comparison to seven percent in 2012, whereas the share of coal is still around 37 percent of the primary energy supply in 2047 compared to around 46 percent in 2012, indicating a drop of just nine percent. From 2010–2015, the indicative global average onshore wind generation costs for new plants fell by an estimated 30 percent on average, while costs for new utility-scale solar photovoltaics (PV) declined by two-thirds. 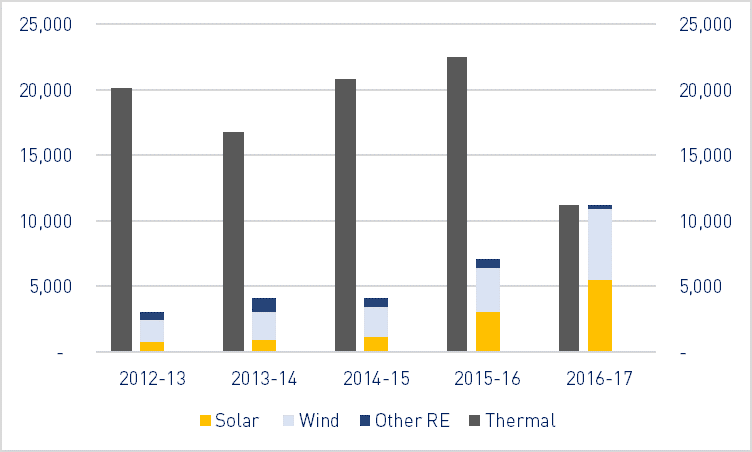 Further, over the next five years, 2015-20, new onshore wind costs are expected to decline by a further 12 percent, while new utility-scale solar PV will decline by an additional 25 percent. Based on these developments, expecting a coal share of 37 percent in the Indian energy mix by 2047 seems unrealistic and quite out of date. Prices for renewables-based electricity have been dropping globally and more so here in India, as observed recently—the winning bid at the Kadapa solar park being set up by NTPC is at Rs 3.15 /KWh which is the levelised tariff for 25 years with no escalation. This is lower than the lowest bid received for the 750 MW solar park in Rewa, Madhya Pradesh (which was around Rs 2.97/KWh and works out to around Rs 3.30/KWh over the lifetime of the power plant). Wind power too has been registering low costs in the range of Rs 3.50/KWh. The effects of this trend of cost reduction in renewables is changing the dynamics of the power sector and rendering investments in conventional power plants unfeasible. Recently, the Institute for Energy Economics and Financial Analysis published a report which concluded that three new coal-fired power plants in the Netherlands are proving far less valuable than expected and are fundamentally out of step with power market trends across Europe. This is leading to debates on the economic feasibility of conventional power plants and calling for divestments of the fossil-fuel based power plants by some stakeholders. TERI recently published a report titled ‘Transitions in the Indian Energy Sector—Macro Level Analysis of Demand and Supply Side Options’ that suggests India should not consider building new power plants based on fossil fuels. There is a huge risk that these would turn into stranded assets in the near future. There have been reports on a 100 percent renewables-based energy system for India: ‘The Energy Report—India 100% Renewable Energy by 2050’ by the World Wildlife Fund (WWF) and TERI and the ‘Energy Revolution: A Sustainable Energy Outlook’ by Greenpeace. Recently, researchers from Lappeenranta University of Technology (LUT) have modelled energy scenarios globally as well as for India at an hourly resolution and derived the least-cost energy mix for 2050. Most of their publications in the context of India concluded that energy supply, fully based on renewable energy, storage, and distribution is the best and only option from the economic, ecological, and technical points of view. Already today, wind and solar power are the most cost-effective options for energy investments. In 2030, fossil fuel and nuclear energy will be non-competitive with renewables. The results of the paper, ‘Electricity System based on 100% Renewable Energy for India and SAARC’ indicate scenarios where a 100 percent renewables-based energy system is possible and lower in cost than alternate high-risk options. Source: Conference Paper – ‘The Demand for Storage Technologies in Energy Transition Pathways Towards 100% Renewable Energy for India’. With the storage, load-balancing, and demand-balancing components, it looks like it is technically and economically feasible to build an energy system with a high amount of renewables. An important complementary solution to intermittent renewables will be storage and as a virtuous circle, development of battery technology which has been spurred by increasing viability of electric vehicles (EVs), which should bring further applications into the power market. The price of lithium-ion battery packs for electric vehicles have fallen 65 percent since 2010 and the trend is likely to continue making batteries cost-effective even for power storage. The government is playing an active role in promoting the adoption of renewable energy resources by offering various incentives, such as generation-based incentives (GBIs), capital and interest subsidies, viability gap funding, concessional finance, and fiscal incentives but needs to develop an integrated long-term plan with renewables at the heart of it. A future-oriented energy system in India will be based on solar PV, wind energy, battery storage, and flexible smart power grids. This article was originally published on Yourstory. Over 99% of Indian villages are electrified, and only one Himalayan state falls below that rate (Wikipedia). Lack of access is not an issue of grid penetration but of rural poverty. Of course, it’s a highly unreliable supply. China overestimated the growth in electricity demand, which has (silver lining) brought forward the coal peak and created the world’s largest stranded asset pool of coal power stations. I suspect the same thing is happening in India. the 2015-16 growth rate was 5.8%, which is pretty representative of the past (see this chart). But there are strong reasons to think that this will slow down a lot. The forces are tertiarisation (shops and offices rather than farms and factories) and technical progress in every electrical appliance from load-following pump motors to air-conditioners to server farms. Developing countries don’t need to set technical standards to benefit from the pressure from rich countries for efficiency. Samsung may design its air conditioners to meet US Energy Star or EU standards, but they will sell the same models in India (with weak standards) and Somalia (with none at all). The most striking efficiency gains are in lighting, with LED lights using a tenth as much electricity as incandescents and fluorescents. This will not slow down. The Internet of Things is just getting started, with pervasive cheap networked sensors and intelligent controllers like thermostats. Of course, the 45 million Indian households without electricity today are going to want a TV, a fridge, and half-a-dozen lights. You can do all that now with 500 watts. Meanwhile the current users are going to get more efficient, as in developed countries. If I’m right, the overall growth rate in demand will fall. As the renewables will enjoy despatch priority, the bad news for coal generators will just keep getting worse. I’m not sure how reliant Wikipedia is, the figures in the above article are from government sources. And it’s 26% of rural households that still lack access. 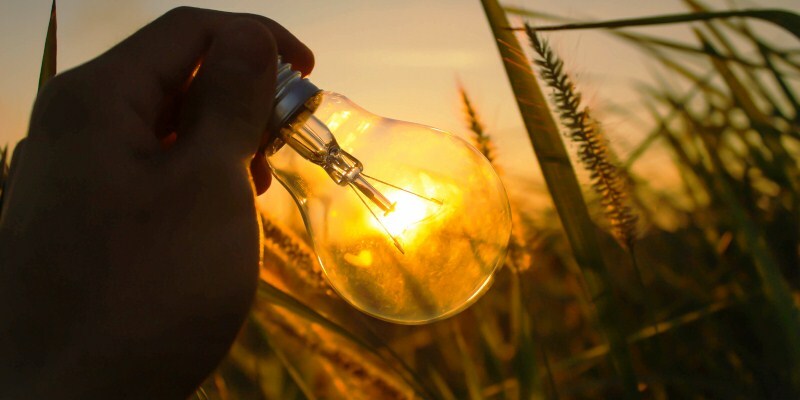 (This is due to the definition of village electrification, where villages are considered electrified if 10% households are connected to the grid in villages). But you’re right that demand in the long term will slow down, but for now it’s definitely set to increase in the next few years and so as the energy sector. Getting more efficient is definitely a ‘no brainer’ and standards are improving as the BEE is doing quite a lot on getting ratings and efficiency labeling practices implemented across various energy intensive sectors in India. However, the fact is renewables are getting way lot cheaper and will continue to do so, and this will definitely change the dynamics of the sector. Ye. If one house in a village has grid electricity, there must be a supply cable running into it and a step-down transformer. Low-voltage distribution cabling within the village is a trivial problem. Many third-world favelas wire themselves dangerously and illegally, just stringing cables from roof to roof. Of course, the Indian Permit Raj is capable of making simple problems exceedingly complicated.